On the 1 hour charts our 4 have pulled back and pausing for a fresh look at the order book to see if they might try a new assault on the recent lows or continue higher for more help/sellers/resistance. The daily Dow shows what a strong support level this has been in the past and the pin bar bounce would indicate it remains so. Fib Levels - Do they work ? So what next? Do Fib levels work? - yes - I mean no. Like all other technical analysis they work fine except for all the times they don't. Of course you can help the odds by adding some extra non Fibonacci numbers like 50 or 87. Or you could always add another level of probability for confluence, say a coin flip for example, so if in doubt flip a coin whereby heads = yes and tails = no. 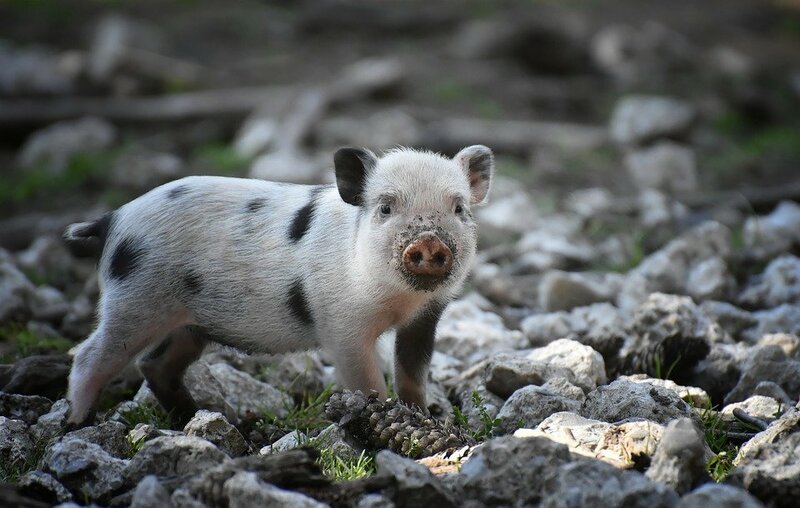 It really all comes down to how many others are looking at the same thing as you, will there be enough to turn a prediction into a self fulfilling prophecy? But there is another way. I like to sail and know that I need to be constantly aware of the ever changing force of the wind. Too much and the boat gets knocked down, too little and you are becalmed, so I make sure I'am always ready for either. I know that change can and will happen at any time so if wind dies down I add more sail, if it picks up I furl some away, simple. Can I predict when these changes are going to occur? - not really, I could take a guess but that's not very efficient. Certainly it may be advantageous to have an idea when/where there might be an increased chance of change but best just to be ready and react when needed, it's a far more efficient and less stressful way to get to where you are going. A great explanation of a very complex subject!!! Dow poised at monthly chart support level so the others will be watching carefully what happens next, minimal movement on Sunday. 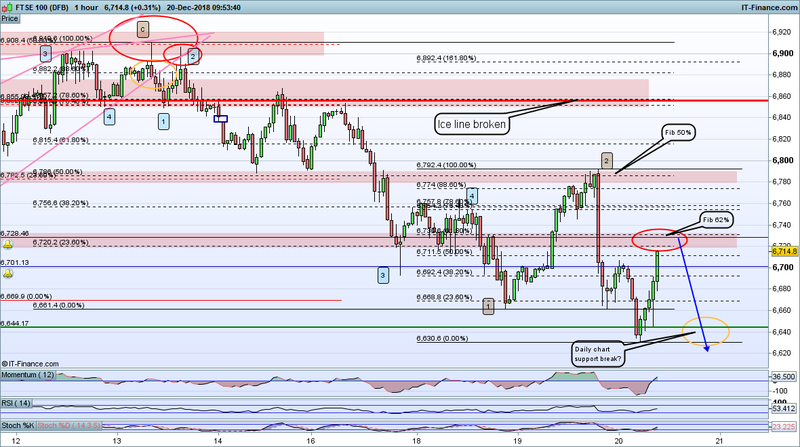 Dax retesting the Friday close and low on the European open. Big V reversal in the Dow yesterday positions Dow and Dax to challenge the recent highs today while Ftse and Nikkei left looking a bit confused. Nikkei continuing the rally overnight, Dax and Ftse looking to clear immediate resistance while Dow hoping for a run up to 24805. On the daily charts and Nikkei sets the pace continuing on the upward leg so looking for Dow to follow and Dax to tackle resistance at 11048. Ftse has got itself up over the 6850 resistance level and will attempt to use as support for a push higher. ECB rate decision 12:45 and another boring Draghi presser at 1:30. China releases negative data which is unusual in itself as China's made up figures are normally at least mildly positive. The admission indy production and retail sales are down substantially shows the trade war is hurting and has had a knock on affect on other indices overnight. Difficult to say whether the morning session will bring recovery or continuation. Have been reading some interesting articles of late suggesting there is more to this trade war than meets the eye in that the US is not really looking to redress past misdemeanours but instead is more concerned with future ones. It's beyond doubt that China steals products, then copies and regurgitates onto the free world market but what about doing the same with corporate ideas. Block the likes of Amazon and Facebook from operating in China, steal the idea and copy the format and allow the copy to operate as a monopoly in the Chinese market which is big enough to create a mega sized company which then gets listed on the NYSE and then release it onto the world market. And repeat this process with every new corporate idea that comes along for the next 20 - 50 years. Not difficult to imagine why some might be slightly worried by the prospect. Starts the week with a strong bounce up Sunday and a challenge to recent short term resistance. The Dax looking for continuation on the European open. A few points to this post, first a look at the weekly charts, Ftse and Nikkei resting on support while Dax still trying to remain in touch. Dow slips below 24119 and will be looking for some relief from the FOMC rate decision tomorrow, a hike was expected but hikes don't usually happen when stocks are taking a hammering like this. 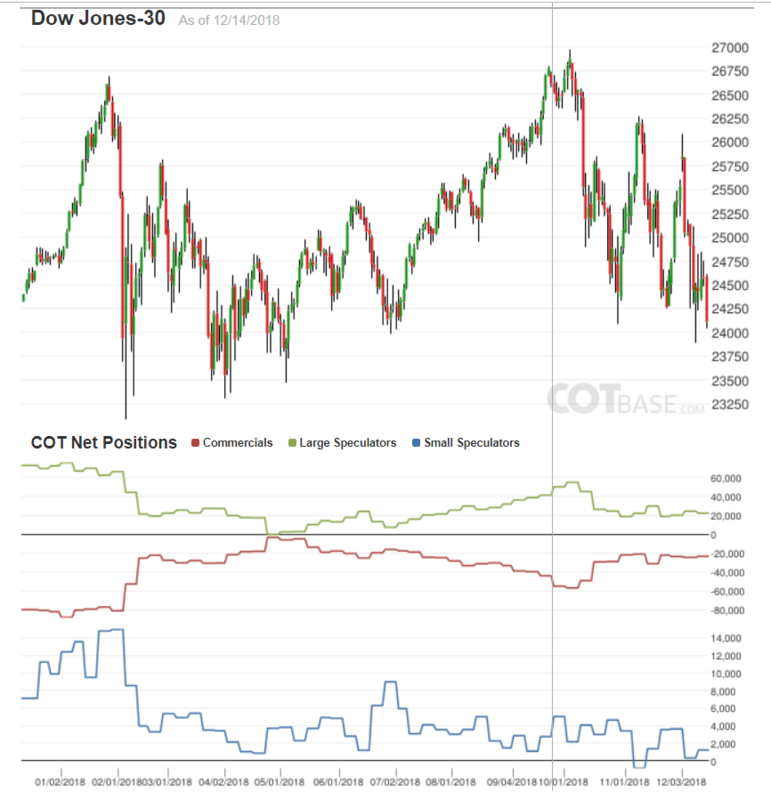 Next a look at the Dow COT report and Large speculators still a reasonably healthy net long. 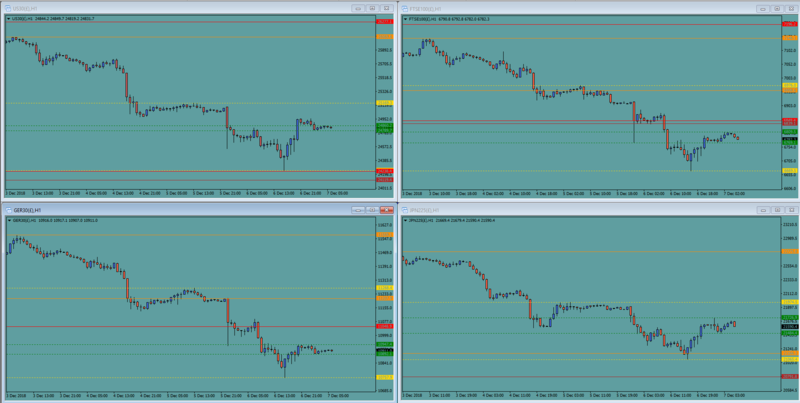 Similar profile for all 4 indices on the 4 hour chart while waiting for the fed rate decision today. Will they or wont they? Given the continuation of the China trade dispute a slow down of the systematic rate rises would seem appropriate but at the same time Powell won't want to be seen to be bowing to Trump. Though having said that the Fed where quite happy to bow to the Obama administration for 8 long years and reject any rate rise at all while the administration presided over the slowest recovery in history while doubling the national debt. It all happened so quick ! So there it is, the Fed are not too worried so carry on. Dow is left resting on 23110 and Dax same on 10584. 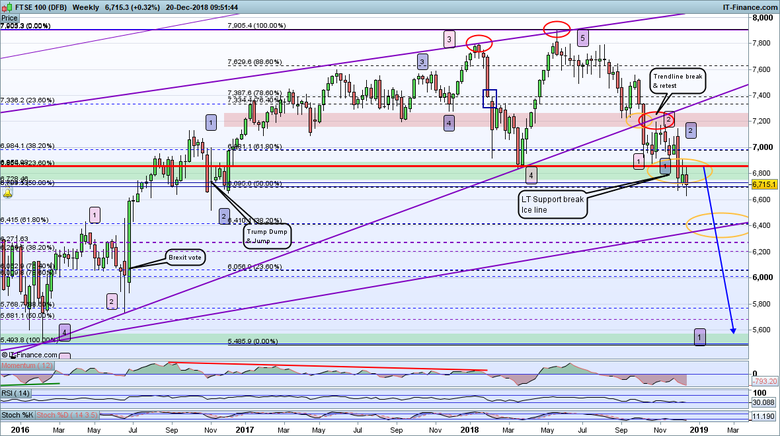 Nikkei has taken the plunge diving below 20791 (weekly support) so lets see if the others follow. 10 min vid from John Kicklighter discussing the FOMC decision plus upcoming BoE and BoJ rate decisions. Another sunny morning and another round of buy the dips into the US open and then the hammer is dropped again? How many times before the market sentiment turns 180? We may not even make it to the US open this time, US futures are not really responding and the Dax traders seem reticent to follow their FTSE colleagues at present. As I posted last night on my US short thread, the SP500 has broken through and closed below a critical ice line support. Dax and FTSE100 did this a while ago and the Russell 2000 has also done this. The Dox is sitting right on its similar ice line and the Nikkei poked through but didn't close below its ice line last night. Only the Nasdaq remains above. In the face of this and a (for me) confirmed bearish trend) how can Long sentiment on the FTSE100 be at 75%? (rhetorical question!). We are now at Dec 20, the Thursday before a fairly long market break and a calendar year end account assessment for professional traders. Surely they can't be holding out for a Santa Claus rally to boost their bonus or more likely get them out of trouble..? When the sentiment does catch up with actual price action, look out below! For good form I advise that I am heavily Short Stock indices. As the latest COT report several posts above shows - large speculators are still very much net long so not a bear market as yet. As for a which way from here, given the Feds acknowledgement of market difficulties and signalling an easing off of the systematic rate rises in future it's just as easy to see this as the bottom of a consolidation range and longer term buying opportunity, time will tell. Ah! You and I use COT differently @Caseynotes. I look for the contrarian signals that everyone is on one side of the boat then run across to the other side. I look at the rate of change on the Net. The net high occurred in Oct and has been unwinding since (i.e. going Short). This always happens at a major turn. Same thing happened in late Jan to end Feb so you could be right regarding a bottoming out except for the fact that the SP500 was stopped at the first significant line of support in Feb 2018 but this time has broken through critical support levels. The Bear starts at the top and turn, we just don't call it a Bear until after the fact. This is why we keep getting swing rallies, people still have hope that the Bull is not dead. Until there is a higher high and an higher low and strong rally away it is a vain hope in my opinion. You need a signal like that to buy. Price action alone screams Bear! Surely anyone buying into this is gambling that this time it is the same and their buy the dips strategy will still work? I see no buy signals on any chart time-frames (I don't look below 1 hour as that is day trader territory). I see a wall of red as the chart below shows and an ice line that is no a big fat line of resistance for the SP500. I see the Santa Claus rally hope evaporated. I see the end of the year account closure fast approaching and the panic taking hold in the pro ranks. I see interest rates rising in the form of the Fed base rate (although the 10 year T-note rates is dropping off a bit, now at 2.75 but may be flattening out). I see the Vix has popped up to 25+ from lows of below 12 end Sept and crucially just above the early Nov levels. The only thing I still see is buy the dips strategy in play causing small rallies for me to sell into. I'd love to hear the case for a reversion to the Bull market other than this time it is different and buy the dips will win out but no one is offering that. Anyone got a case for the Bull they would care to share? I agree with you in that I see the US indices going downwards and the price action fully supports that view at this moment in time. I think you are right in highlighting shorting indices in previous posts. You are certainly on the right track on that one. 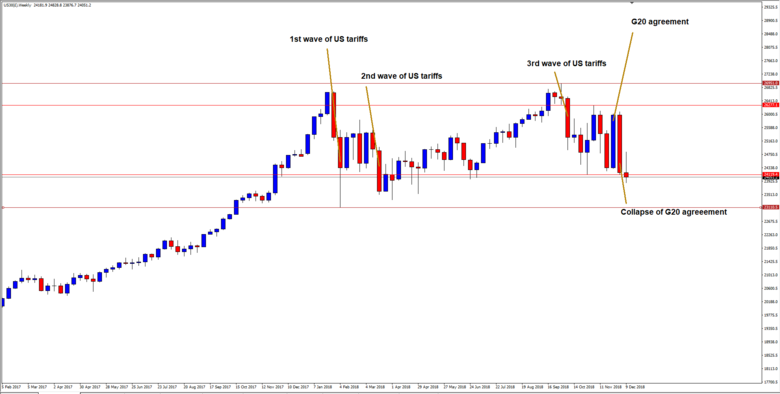 There are many indices such as US, UK, Europe or even Japan that are nice shorts based on price behaviour and trends. Looking to go against large speculators has never really worked out for retail traders @Mercury as the graph shows, they tend to come off the poorer. We have all seen the cause of this consolidation period as being the deliberate attempt at the restructuring of the trade relationship between China and the US at the same time when the Fed decided to start systematic rate rises, both these acts are discretionary and subject to change. Interestingly the central banks are going off the idea of forward guidance allowing more scope for a more flexible approach. As shown above the chart matches the timeline for US tariff wave implementation rather than any other story line and will probably continue to do so, that's what price action is 'screaming'. It doesn't really matter what name is given to the general movement, you could say we had a bull from end of 2016, bear run Jan to April this year, then a bull run to October, then a bear run etc... Any run can turn on a sixpence as we have seen countless times. You are correct that many people wear their bias like a straight jacket even when the evidence proves them wrong for months into years at a time, certainly an over reliance on the technical at the exclusion of the fundamental can cause major blind spots. Fortunately I don't really need one as I'm only interested in a session at a time and happily follow the Hull moving average up or down which ever way it happens to be going. I am impressed with the mention of Hull Moving Average (HMA). Not a lot of traders on the IG Community will be aware of it. It would be nice for IG to offer it as an indicator on its platform. It is the best one to eliminate lag and improves the smoothness of the curves. There is actually a formula for it. I know a few traders who apply the strategy of going the opposite. So for example if 90% were long on a particular asset then they would go short. I understand the logic behind this rationale but it would mean trading against the trend and this is suicidal. What if those 90% who were long decided to add to their long positions? What would that do to a trader that took the opposite view and went short? It would destroy their trade. I think if one wanted to apply such a strategy then a more sensible approach could be to monitor the amount of longs and if this began to reduce and at the same time the price action supported this then maybe to enter a position with momentum on their side. However this is very simplistic. One would need to devise a specific trading strategy that would increase the odds in their favour and give them a better chance of succeeding in the trade using specific entry and exit points based on applying some data analysis. Indeed @TrendFollower, Alan Hull has a web site where he explains how it is calculated, very clever. With regards to contrarian trading DailyFX use their (IG) Client Sentiment strategy https://www.dailyfx.com/sentiment?ref=SubNav, their data is from IG retail clients where 80% are wrong at any one time but of course that's retail clients not large speculators. I appreciate this is not what @Mercury is doing but rather using percentage change but it is not hard to find times in the COT graphs where the retail traders have been completely wrong footed trying to front run the large speculators. Yes, I am aware of the website. From memory it states the formula to calculate HMA. 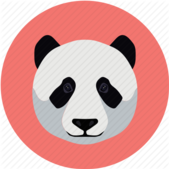 It is very dangerous to use IG Client sentiment. This would imply one has faith in IG's clients making correct and profitable trading decisions. Based on some of the questions raised, views and opinions, I am not so sure. 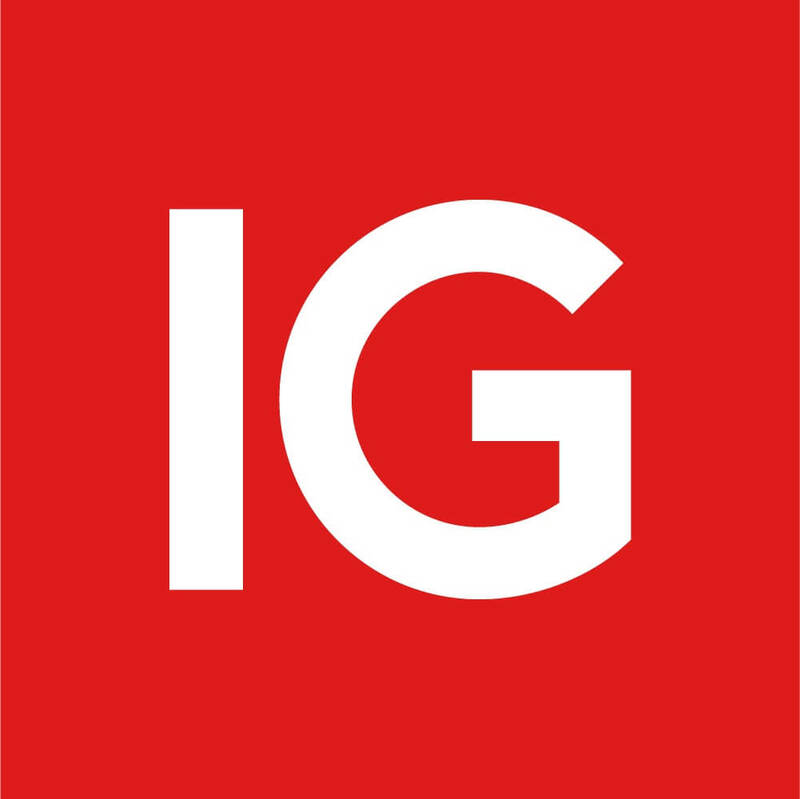 If IG themselves are reporting that around 80% of their clients lose money then I do not have much faith in IG's client sentiment unless it is fully supported by price action.